The ancients were fascinated by the nature of things taking place in the world beneath their feet. The forges of Vulcan lay beneath Mt. Etna, salt was manufactured by Poseidon under the sea bottom, and the underworlds of countless cultures lay somewhere beneath the deepest caves or mine shafts: the earth could part at anytime for Hades and his three-headed hound to emerge from his domain, as occurred during the abduction of the hapless Persephone. This subterranean world, whether as a place of torment, dwelling of not-men or simply an inner kingdom hidden from the prying eyes of mortals, continues to exert a powerful influence over contemporary humans, taking on new guises in the modern folklore of underground alien bases in the desert, reactivated German submarine pens below the deepest Norwegian fjords, or the persistent belief in a hollow earth accessible at the planet's poles. Psychologists have identified these beliefs as external representations of the human unconscious; others think "the underworld" offers an unreachable abode in which these beliefs can exist safely unchallenged. Are all stories of underground realms untrue? Not at all. The Catacombs of Rome are an example of how a community could gather in a place to bury its dead and hold worship without ever attracting the attention of a repressive government. Beneath the palaces of the Caesars were vast caves, tunnels and shafts, and fires of peat, lignite and igneous earth, lit by no man, burned in these air accessible depths, contributing to Christian concept of a fiery Hell. Old dead cities lay beneath the Eternal one. Medieval hermits in Asia Minor hollowed out entire cave systems in the mountains of Cappadocia, some of which are still in use today. Recent archaeological discoveries have located a network of nearly three dozen subterranean cities in the Anatolian valley of Goreme, which apparently housed over 20,000 people at a depth of twenty stories, linked to each other by tunnels nine miles long. It has been conjectured that these Stygian communities housed the remnants of the Hittite culture, perhaps following the destruction of Carchemish, protetcting them from invading cultures. Successive conquerors occupied the subterranean cities, such as Derinkuyu (discovered in 1963) until finally deserted during the Ottoman period. Who built these vast networks of subsurface habitations remains unknown.Yet existence of subterranean societies is not exclusive to antiquity. Much has been written of the elaborate Chinese civil defense bomb shelters constructed in the 1970's beneath Beijing, capable of housing a sizeable share of the city's population in the event of a nuclear bombing, and Fidel Castro's elaborate bunkers on the island of Cuba, from which a guerrilla war could be fought against invaders for years. During the Vietnam War, U.S. patrols in Laos were stunned to discover "underground hospitals of mammoth size...tunnels big enough for trucks to go through underground" along the Ho Chi Minh Trail, which had eluded the best visual reconnaisance from the air, in spite of the fact that visible traces of human habitation--roads leading to caves on mountain tops, large tree houses--were on the surface. case can be made for the existence of civilizations--perhaps even non-human ones--existing or having once existed in the ground beneath our feet. The belief in secret subterranean "kingdoms" can be found in almost every culture on the globe. 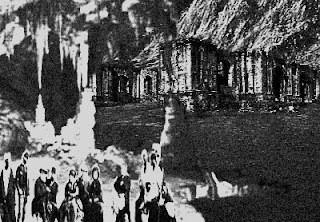 South American anthropologists have searched for decades for sthe underground cities of Ysidris and Erks in Argentina; Central Asia is rife with tales of subterranean Agartha, the hidden realm presided over by the King of the World, whose reach can be felt as far away as the Americas thanks to a network of tunnels that link to his domain; Caves in the Pyrenees and in the sierras of northern Spain have been traditionally considered as the entrance to malefic non-human abodes. Jacques Bergier was of the opinion that the theory of said subterranean realms was not absurd a priori , but there was no evidence to substantiate such claims, and that "surprises may be in store in this area." The archaeologist's shovel and fortuitous discoveries by laymen have added to the knowledge accumulated over the decades in this field. shall reveal the secrets of my journey upon my return." After a seventeen day search, rescue parties were unable to find any trace of Debru's expedition. American explorer John Perkins may have found the entrance to the underground realm that Debru sought: he followed the course of a river that plunged below the surface into colossal caverns lit by greenish light issuing from strange, unclassified vegetation. The truth of the matter is that South America, and indeed, most continents, appear to be riddled with tunnels leading far and deep toward somewhere. Most investigators have turned back when they have encountered either unsurmountable obstructions or tunnels filled with seawater. There is no doubt about the artificial nature of this phenomena, or that their creation in the hardest bedrock would have involved either explosives, lasers or chemical means of eroding stone unknown to 20th century science. The Americas do not have the monopoly on such structures: archaeologists have discovered a maze of subterranean galleries--their origin and purpose unknown--beneath the French town of Provins. Vast, high-ceilinged rooms with columns form part of the mysterious underground layout. Evidence exists that some of these rooms were utilized as storerooms during medieval times, but some of the galleries were not discovered until the 20th century. The Provins complex also includes a series of ample caves that do not seem to connect with one another. The cave walls are covered with the same Neolithic symbols--labyrinth-signs and concentric circles--which can be found in the Canary Islands, Sardinia, Malta and even as far away as Brazil. Mexican author Rodolfo Benavides pointed out the (unconfirmed) existence of a network of underground passages and even a temple beneath the Egyptian Sphynx in his book Dramáticas Profecías de la Gran Pirámide. Whether these tunnels link up to other similar passages remains to be discovered, although a number of recent finds in the Gizeh complex--the possibility of an undiscovered chamber in the Cheops pyramid and the unearthing of a funeral barge--do not rule out the possibility. The "moonshafts" of Eastern Europe must also be added to the category of subsurface galleries. Dr. Antonin Horvak and a few fellow partisans sought refuge in one such "moonshaft" near the Slovak villages of Plavince and Lubocna while fighting against Nazi occupation forces in World War II. Dr. Horvak noted in his journal that the structure had walls six feet thick amd that its shape "served no purpose he could imagine." Dr. Horvak also stated that he felt "in the grip of an exceedingly strange and grim power" during his sojourn within the smooth, black structure. What are the origins of these clearly prehistoric subterranean features? Speculation has ranged from the sober (places of worship for the followers of "mystery cults" throughout the ages) to the fanciful (dwelling places, active or abandoned, of nonhuman entities). A synthesis of these two concepts is embodied by the Spanish cave of Ojo Guareña--well over twenty miles of chambers, passageways, underground lakes and unusual entrances--a place where initiates into ancient mystery religions came into contact with the subterranean "deities" that dwelt out of sight of man. Spanish author Juan G. Atienza has pointed out that the cave still exerts a powerful grip on the neighboring farming communities, and that some of its many entrances are shunned as being outright evil. Some of the cave system's unusual features include a crude diagram representing the helicoidal structure of DNA--a fact utterly unknown before the 20th century. In a cavern room known as Caite 2, archaeologists discovered human representations on the walls, one of them of a figure wearing what could be interpreted as a space helmet. Footprints leading into the cave system point to individuals who entered and never came out, and very strange individuals, at that. The author speculates that they were either 8 to 10 year old children or adults with a foot size of 4 or 5, if they were human at all. Another curious feature of the vast underground structure is the existence of an old man, a self-described warlock, who explored the caves as a child in spite of his grandfather's warnings that he would one day "encounter the divinities" that lived underground. The old warlock made a display of his uncanny psychic abilities before José Luis Uríbarri, the archaeologist whose life's work has been the exploration of Ojo Guareña. The archaeologist stated that the warlock wished to transmit "his hidden knowledge" of Ojo Guareña to someone before dying. Whether his revelations lead to even more disturbing discoveries remains to be seen. Article continues here on Saturday, March 24, 2012!